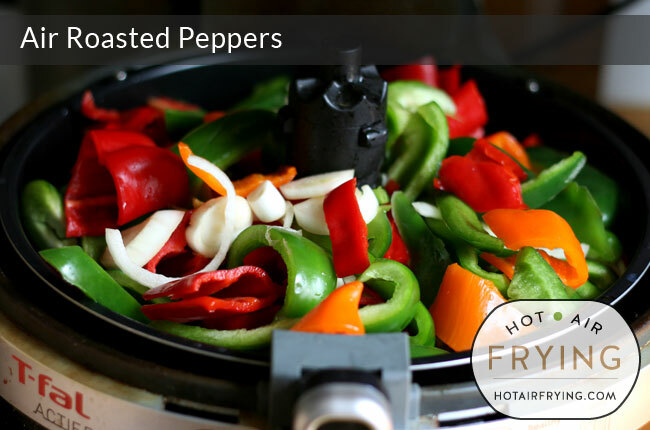 Roasting peppers can be a lot of pfaffing about but it doesn’t need to be with a hot air fryer. This recipe is for both paddle-type or basket-type fryers. You can serve these as-is as a side dish with grilled meats, etc, or, freeze in small bags for tossing into pasta sauces, stews, casseroles, chilled salads, etc. First the recipe, then the discussion. Put olive oil and maggi in Actifry pan. Peel and slice onion; add to pan. Wash, cut, stem, seed and slice the peppers. Add to pan. Quantities are for a 1.5 kg (2.2 lb) size Actifry bowl. If you have a smaller machine, keep oil and Maggi quantities the same, but cut bell pepper quantity in half. If you don't have Maggi, just omit. Or try something else that strikes your fancy. A few drops of liquid smoke? Some Worcestershire sauce? I suppose the onion is optional, too. I just thought the flavour added a little more interest. And the roasted onion is very nice. Fresh garlic I think would burn. 1. Put olive oil and maggi in large bowl. 2. Peel and slice onion; add to bowl. 3. 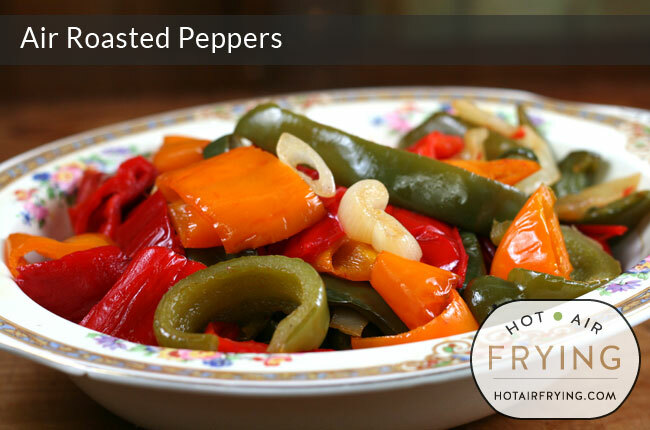 Use only 6 bell peppers. Wash, cut, stem, seed and slice the peppers. Add to bowl. Mix all with your hands. 4. Put in air fryer basket. Cook for 15 minutes at 160 C (320 F). 5. Dump basket into your stirring bowl. Stir. Put back into air fryer for a final 5 to 10 minutes. This recipe is easy enough to cook — the work is in the prep; there’s a fair bit of seeding and chopping with the peppers. Just turn the radio to a channel you like. I know that right off the bat the question of peeling the peppers is going to come up, because that is considered sacrosanct, but honestly after all these years I still don’t find it necessary, and so still don’t do it. I know, shock and horror. I don’t peel my mushrooms, grapes or asparagus, either, as used to be de rigueur with the Victorians. In this recipe, I do fish out and discard any pieces of skin that happen to come off and curl themselves up into tight, tough curls, but otherwise… no. 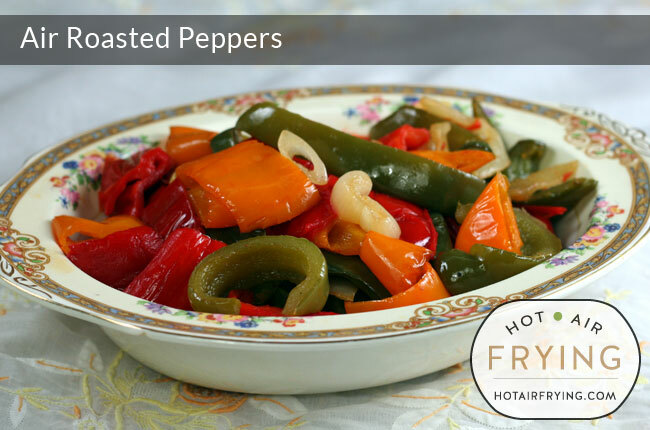 After the peppers are cooked and cooled, you may certainly go at them if you wish; it should be quite easy. Use whatever varieties and mix of peppers that seems best to you or is on sale, really. I conceived this as being a recipe for ‘sweet’ (as opposed to ‘hot’) peppers, but if you want to sneak a few hot ones in too, hey. I like to get rid of all the seeds. There’s no great hidden stores of protein or other nutrition in them, and they just get stuck in your teeth. 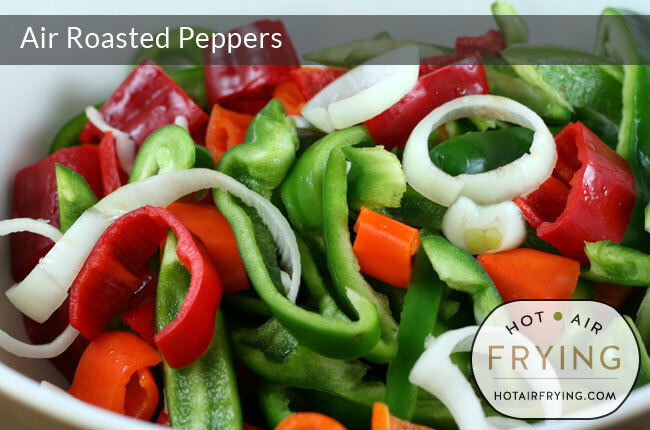 After you’ve cut the peppers open, scoop out with your hands or scrape away with a paring knife all the seeds that you can, then give the pepper pieces a rinse under the tap to wash the few remaining stubborn ones away. 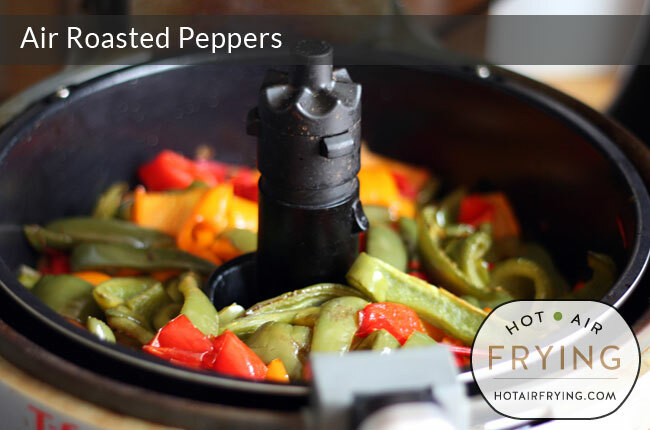 You can see how the 12 bell peppers will just fit into a 1.5 kg size Actifry bowl. It’s a lil full, to be sure, but the machine will manage, because the peppers are light and they have so much water in them that they will start to shrink down fast. I would just stand-by for the first 3 or 4 minutes in case a pepper that is still firm causes the paddle to stick. Above you see the peppers pretty much done. Not much left of that huge full pan, eh? I know a dozen bell peppers seemed like a lot to start with, but they shrink down to less than half size in volume. Makes 1 kg / 2.2 lbs / 6 cups. There are 10 x 100 g (2/3 cup / 3 oz) ** servings in the recipe. 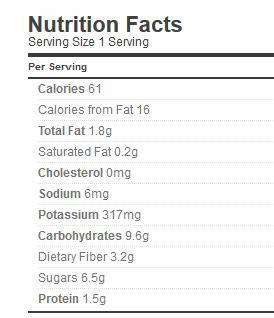 ** In cups and oz, it’s actually more like 5/8ths a cup and 3.5 oz, but who can measure that in a kitchen on the fly, and besides, the resulting recipe yield in cups and weight will vary anyway by variety of pepper used, the growing seasons, phase of the moon, etc. Close enough. 1) Always heat the fat that you are using first. I usually give it 2 minutes minimum. When you throw your onions in, they should sizzle like they would do in a pan on the stove. I find duck fat the best, but this trick works with vegetable and olive oils as well. 2) When you are doing more than just onions, you need to think about how long each vegetable will take. For example, I usually do onions first, then add sweet bell peppers after 5 minutes, mushrooms after that, etc. Generally to do a good mixed vegetable stir fry, you add ingredients in increments based on how long, or how well cooked, you want them to be. Do not add all at once. 3) Another trick for just onions is to add a splash (and I mean a small splash – about a tbsp) of balsamic vinegar after you have done the first 5 minutes of cooking after adding to the hot oil. This gives your onions a really nice glaze and wonderful deep flavour. 4) Another trick is adding a splash of wine once you have your “longer to cook” vegetables added. This helps soften the existing vegetables and brings a great taste those vegetables that need less time. Overall, I usually spend about 25 minutes or so for onions, and depending on the variety of additional vegetables it can take up to 30 to 35 minutes.